We all know I can write long. Even Alex Ross knows this. But can I write short? Uh… Not really. So to practice, I’m going to take the Strib’s review word count and work within that limit. This week’s Minnesota Orchestra Strib review belonged to Michael Anthony and clocked in at 456 words, so I’ll try to stay under 450. I do like to go long when I’m actually in the hall – in-person, I always see and hear a lot I want to write about – but when I’m just listening over the radio, I don’t see any harm in going short. I’m calling these micro-reviews. For lack of a better term. If anyone wants to join in on the micro-review fun, do. The more the merrier when it comes to discussing concerts. You know the best way to listen to a Minnesota Orchestra concert? Well, it’s better than nothing. After a fashion report from Brian Newhouse (apparently Erin Keefe was wearing a “beautiful dark blue sleeveless gown”), Friday’s concert began with the Mendelssohn violin concerto. It was disorienting to jump into a concerto without an overture, but there was a 70-minute ~WAGNER EXTRAVAGANZA~ after intermission to consider. The orchestra played with fine, elegant understatement. And I’m not sure I cared for that. I usually like my Mendelssohn with icy aristocratic soloists and wild-eyed accompaniment. It was the opposite dynamic here: Erin was providing all the fire, and the orchestra the cool restraint. Maestro Wigglesworth was completely justified musically, historically, and philosophically in taking this approach, but I need more time to decide if I liked it or not. Lest you think I’m bitching, I thought the orchestra played beautifully, and the wind section in particular made some of the most stunning contributions I’ve heard in any Mendelssohn, ever. The single bassoon note linking the first and second movements startled me with its character. And need I say that Erin Keefe played flawlessly? Silver tone, searing vibrato, character to burn… She’s perfection. Next came the Wagner adaptation and its attendant harps and horns. Also, horns. …has me skeptical before a single note is played. Hey, did I mention there was brass? There was, and they played gorgeously, majestically, with a rich, plummy sound. But one detail made it tough for me to truly enjoy this piece: namely, it was by Wagner. Apparently the Minnesota Orchestra has played this extravaganza every ten years since 1994. Maybe in 2024 I’ll go see the next performance. 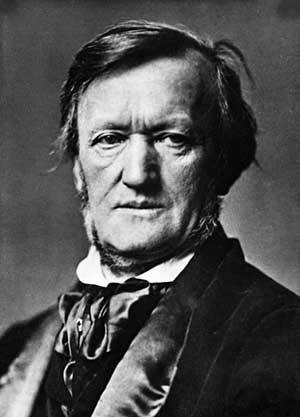 Just because I’m wary of Wagner doesn’t mean you should be. 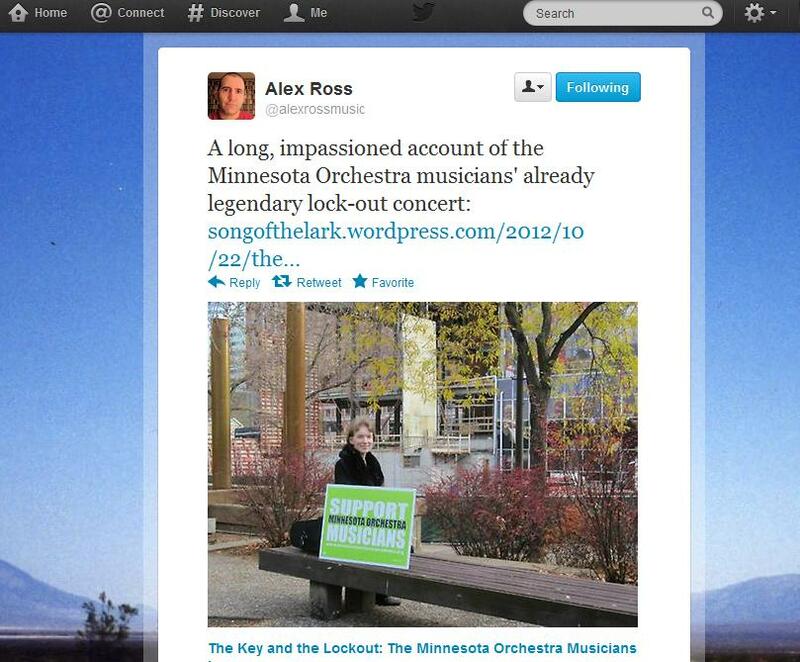 You can still buy tickets for tonight at minnesotaorchestra.org. Erin’s Mendelssohn is worth more than the price of admission. If I was in Minnesota this weekend, I’d be going in a heartbeat. Enjoy yourself! My next entry was going to be about the extraordinary Tuesday night we had at Orchestrate Excellence’s forum with Dr. Alan Fletcher. And there’s still a part of me that wants to cover that. But, um. Something happened on Wednesday. Namely, I posted an entry about the MOA cyber-squatting, and then went to a doctor appointment. WHAT – IS – HAPPENING? I JUST WENT OUT TO A DOCTOR APPOINTMENT AND GOT SOME PIZZA; THAT WAS IT!! AND THEN I GET BACK HOME! AND SUDDENLY EVERYTHING IS ON FIRE!!! I CAN’T LEAVE YOU GUYS ALONE FOR A SINGLE AFTERNOON, CAN I?? Stats! Going through the roof! Facebook likes – by the thousands! Lame jokes about The Fifth Estate! Coverage on NPR and MPR! The failure to mark these purchases as private seems indicative of the general level of competence in the current management. A special citation for Quickest Plunge from a Great Height goes to the management and governing board of the Minnesota Orchestra. My dear dear dear Mr. Ross, on the off-chance you’re keeping an eye on this blog…. I wouldn’t have entertained the idea of even dabbling in music journalism if I hadn’t read The Rest is Noise. You showed me what was possible. Thank you. Any readers of mine who haven’t yet read it, pick – up – a – copy. It will entertain and inspire you throughout the lockout. Promise. Best Decision: Starting this blog. Best Concert as Performer: Community Table, April 2011. It impressed upon me what’s really important about our art. It’s not about the repertoire or the competition or playing every note perfectly. It’s about passion and communication – saying things that can’t be said in words. Everything else is a bonus. Best Concert as Audience Member: This category was super-difficult. I had the immense honor of seeing the Minnesota Orchestra three times this year. Only two of the concerts got written up in reviews. But I think my favorite was actually the one concert I never wrote about – the Ravel Inside the Classics concert in Minneapolis in March. First of all, it was repertoire I’ve loved forever, and second, it was a lot of fun to hear musicians talking about it. That weekend opened so many doors for me, intellectually, emotionally, professionally… It was everything a good concert should be, and more. Possible Honorable Mention – I have tickets to one of the music world’s most coveted concerts of 2011…the final Bon Iver homecoming concert in Eau Claire on December 13. I have a gut instinct it will be one of the musical highlights of not just the year, but my life. Worst Concert as Audience Member: Once again, won’t say, but the problem wasn’t actually the music, it was the snotty people around me! Biggest Musical Regret: Not being part of an orchestra. I’m in a string orchestra, and I love that, but there…are times…that…I miss the brass and woodwinds. Okay, I said it. I won’t say it again. Favorite Repertoire: Bach g-minor adagio. I will work on that piece until the end of my days and still not get to the bottom of it. But it’s so satisfying to try. Favorite Impromptu Concert: A friend played some solo Bach for me on a warm breezy August afternoon. We were in the parlor of an 1880 house and the porch door was open and the birds were chirruping out the bay window. Those few moments were perfect. For the rest of my life, whenever I hear that piece, I will remember that moment in the parlor, and how the tears started draining down my face. Best Remix: The Oh Long Johnson cat remix. Obviously. Worst Comment by a Conductor: From a guest conductor, and inappropriate to reproduce here. Best Non-Classical Group And Track: Bon Iver. I love just about every one of their songs, but… The one that was the gateway drug for me was Skinny Love. Yeah, I’m a few years behind the times. Sue me. Best Musical Movie Scene: Actually, make that seventy years behind the times. This year I discovered Fred Astaire and Ginger Rogers, and in particular, their dance to Night and Day. I covet Ginger’s dress, which is the single most beautiful gown I’ve ever seen. Favorite SotL Blog Entry, Tagged “My Writing”: Out of the fifty I’ve posted this year, this one. Favorite SotL Blog Entry, Tagged “Not My Writing”: This one with Marie Hall. Her personality just shines through the pages. She was fearless. Best Lyrics: From Bon Iver’s Holocene – And at once I knew I was not magnificent / strayed above the highway aisle / jagged vacance, thick with ice / I could see for miles, miles, miles. Those words say it all, really. They celebrate the significance of insignificance. If that makes any sense. It’s my Song of the Year already. Most Encouraging Hometown-Related Epiphany: You can be based in Eau Claire and still take on the biggest names in music. Best Music Blog: Inside the Classics. If I can be half as entertaining and informative as the folks over there, I’ll be a very happy blogger. Honorable mention, Emily Grossman’s thirty-day blogging project at violinist.com. Best Music Website: Violinist.com, always. Best Music Book: I’m not exactly in the center of the music book biz (/understatement); everything I read is courtesy of the Internet or the library. But the best book of the year that I did get my hands on was Alex Ross’s collection of essays, Listen to This. Most Blatantly Obvious String Instrument Dub: The violinist on Celtic Woman. Favorite Single Line I Wrote This Year, Taken Completely Out of Context: Everything about her was predictable: her eagerness, her enthusiasm, her obsequiousness, her obsessive thirstiness for knowledge, her conviction that classical music is a sacred art and every semi-talented practitioner of it a kind of high priest. Best Colbert Report Duet: Technically not on the Colbert Report, but Stephen’s rendition of the modern-day classic “Friday” on Jimmy Fallon’s show. It was done to raise money for arts education in public schools, which is a cause I think anyone reading this blog can get behind. Weirdest Google Books Find: This was a very strong category; I am a magnet for vintage Google Book crazy. In the end, I can’t decide between the article about brass players going bald from 1896 or or the crazy hilarious sexuality of musical instruments article from 1921. Favorite Bit of SotL Spam: You guys miss so much spam on my blog. So much of it is so entertaining that I almost feel like starting a separate blog for hilarious spam. But the best one came about a week or so ago, when I had one from a diarrhea prevention website that quoted Mark Twain. Not even kidding. Favorite Tumblr: Aside from mine, of course? Cough. Actually, Facepalmmozart. About half of the entries I reblog on my Tumblr come from there. I can’t choose just one, so here are five. 2) Marie Hall anticipating the rise of female conductors in 1905. 3) Portrait of Marion Osgood, writer, violinist, teacher, conductor…the list goes on and on. 4) Portrait of Leonora Jackson in a lovely Victorian room. 5) A picture of Irma Saenger-Sethe and a quotation from the Bach d-minor partita. Best Lesson I’ve Learned: Do what you want to do as an artist. Trust your gut. If you’re good at what you do, and you have potential, then seize that potential, and don’t make excuses. Don’t let anyone keep you from doing what you want to do. If people keeping you hostage emotionally, and you decide to keep quiet about it to not upset them… You’ve lost. You’re either going to do what you want to do and have them be angry with you, or you’re not going to do what you want to do, and then you’ll get angry with them, and then they’ll get angry back. Both alternatives are painful. Incredibly painful. But the first one less so. Best Bet for Best Concert of 2012: Minnesota Orchestra and Ehnes in Brahms concerto in January 2012. Or the premiere of Judd Greenstein’s new Microcommission work for the Orchestra in March. But who knows…it may turn out that the best concert will actually be the one I have no idea is happening yet. Now that is an exciting thought. Crazy Musical Goal That I Feel Insecure About And Will Continue To Waffle About Over The Next Several Months: Auditioning for a local orchestra. Secret Musical Goal That I Feel More Confident About: To become semi-fluent in alto clef. Yes, I’ll admit it: I’m seventy-five percent sure I’m going to rent a viola next year. Edith Lynwood Winn said every violinist should be able to play viola, and I definitely think there’s some truth to that. I can’t imagine it will ever become my first instrument, though. I enjoy viola jokes too much. (And more seriously, I’m a very high-strung tension-prone double-jointed small person, and it remains to be seen how well I’ll take to a bigger instrument.) But in any case, I do hope to do this, and blog about the experience. What You Can Expect From This Blog In 2012: I don’t even know what to expect on this blog in 2012! But safe to say it’ll probably include a lot more discussion about female violinists and, more broadly, the history of women in classical music, period. Because there just is not enough information out there about the wonderful women who made it possible for me and all the other ladies out there to partake in this beautiful art form. I love this blog and I love my readers. Really and truly. Thank you for coming back again and again, and as always, if you have any questions or comments, please let me know. A happy holiday season to you and yours. This was an important review for me. It originally appeared on violinist.com here. So yesterday I went to the last performance of the Minnesota Beethoven Festival featuring the Minnesota Orchestra. After hearing extraordinary concerts by the Miró Quartet and Midori, I confess I didn’t know if the standard of music-making could get much higher. I will shamelessly steal from Mr. Ross and say, for the duration of the afternoon of July 18th, the Minnesota Orchestra sounded, to my ears, like the greatest orchestra in the world. The program was Beethoven’s fourth and seventh symphonies. The moment they began, I actually remember thinking, well, there goes my review. I knew there would be no way I could write objectively about what I was hearing. If a certain phrase was accented in a way that I particularly liked, or the voices were gorgeously balanced in the last movement, or a brass player had a couple of muddy notes in one measure – who the hell cares about such trivial details in the face of such charismatic, youthful, invigorating music-making? I fought it – trust me, I did – but it only took about twenty seconds to feel the tears dripping down my face. I couldn’t help it. The energy of all those musicians who had worked so hard for all of their lives, all coming together – how many years of study do they share between them? Say there’s a hundred orchestra members, and each has played an average of thirty years. That’s three thousand years of practice at the highest possible level. That’s extraordinary. In what other genre of music do you get to hear three thousand years of practice come to fruition? I’ll try to remember little bits and pieces to give a vague idea of what it was like, but honestly I was rendered rather speechless. There was power suffused with delicacy – extraordinary dynamic range – palpable commitment on the part of everyone onstage, from the strings to the brass to the woodwinds to Maestro Vanskä – elegance – earthiness – charm – passion. Passion above all else. These musicians were so excited to share their love of the music with us, and the electricity in the hall proved that the audience was just as excited to hear it as the orchestra was to play it. It was such a special feeling to communicate with these extraordinary virtuosos in that intensely personal way. I wish I could tell you more than that – give you more details about what exactly I loved – but I really can’t. I was too carried away by the joy and power of the sound. There is nothing to say except this is the pinnacle of our art. This is why I love music. This is one of the greatest experiences a human being can have. When the Seventh ended, of course there was an immediate standing ovation, the most raucous of the entire season. The Orchestra actually had to leave the stage to make us shut up. I haven’t seen a full symphony orchestra ever have to do that – chamber orchestras, yes; full symphonies, no. You know how some people idealize baseball players? And root for their favorite team? And know all the members of the team by heart, and their stats? Yeah. I may live in Wisconsin, but the Minnesota Orchestra is my home team. It was, needless to say, a perfect closer to the Minnesota Beethoven Festival. Next year for the season finale they’re playing Beethoven’s Ninth. I almost fear going. If I go out of orbit for the Fourth and the Seventh, what am I going to do for the Ninth? Well, I can’t help it. I love this music and I feel an intense bond with the players who bring it so magnificently to life for me. If I decompose and melt into a puddle on the floor they will just have to mop me up. Three cheers for the un-friggin’-believable Minnesota Orchestra. If they ever come to your neck of the woods, I have nothing to say to you except: GO. I have learned more from these three concerts I attended this summer at the Beethoven Festival than I have in a very long time. My love of music is more passionate than ever. Here’s to world-class music making at a world-class festival in a world-class state. Words can’t describe how much I’m looking forward to the years of happy music-making ahead of us. Postscript – At least one reviewer agrees me! Here’s the review of the concert from the LaCrosse Tribune, in which the writer claims this is one of the greatest orchestral concerts he has ever heard.